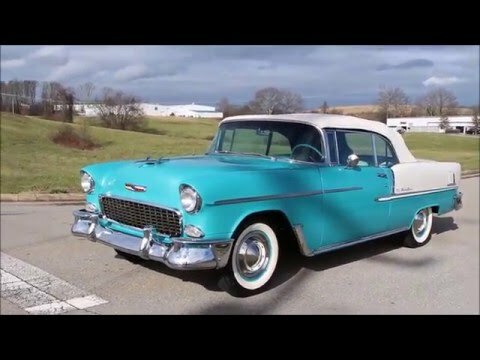 Up for sale we have a 1955 Chevy Bel Air Convertible. The body is laser straight with good fit and finish of the panels. All the side stainless has a great fit and lines up as it should. The body is covered in the correct Regal Turquoise and Indian Ivory two tone scheme that is slick with a deep shine. Inside the jams, under the hood, and inside the trunk is very clean as well. The top was replaced at the time of the resto. The stainless around the side windows and windshield is in very good shape. To complete the look, it has painted rims that are covered with full size hub caps a set of wide white tires. Keeping with the theme it's done in the original interior color scheme as well. It has the correct bench seats that are covered in the correct covers. The door panels and carpet also look correct. When you look at the dash it's all correct with the only upgrade being the tissue dispenser under the dash. This Bel Air also has a white convertible boot cover. Under the hood it's true to the original identity. It features the 265 V8 that's painted as it would have been. Being a 265 it has a remote mount oil filters and the oil bat breather. The firewall and inner fenders are all done correct. The trans is the Power Glide that's mated to the stock style rear end. This Bel Air has the stock style brakes and steering that have been rebuilt. When you look under this Convertible it's all clean with new body bushings as well as new bushings front and rear.